Product #15943 | SKU SES-A-V-SYNC | 0.0 (no ratings yet) Thanks for your rating! 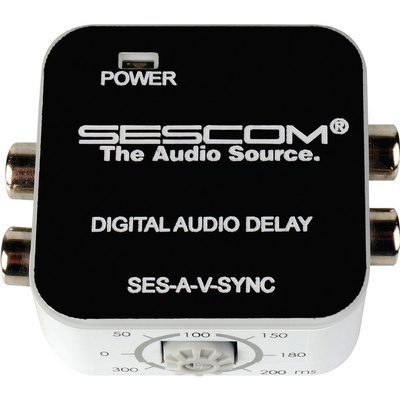 The affordable and compact Sescom SES-A-V-SYNC A/V Lip-Sync Corrector is a left/right in-out audio and video synchronisation corrector, which essentially fixes audio delays between audio and video. When distributing video over long distances through multiple devices, there can be a noticeable delay which results in audio being played before the video. This also happens when the audio from a source is sent to an amplifier over analogue lines, while the video is send to the display over HDMI or digital lines. The SES-A-V-SYNC fixes this "lag" and it can be manually adjusted, which means that the audio delay can be set from 0 to 300 ms in set increments. This will allow you to perfectly sync your programme's audio and video and greatly enhance your audio/video experience.